Imperial College London has opened its biggest new academic building in a generation. The £167 million Molecular Sciences Research Hub on the College’s White City Campus is the UK’s most significant scientific development since the Francis Crick Institute and the largest investment in a university building in 21st century London. The Molecular Sciences Research Hub was opened by the Mayor of London Sadiq Khan with Imperial’s President Alice Gast , Science Museum Group Chair Dame Mary Archer and Bernard Taylor , Chair of the Royal Commission for the Exhibition for 1851. Designed to break down traditional barriers between scientific disciplines, the Molecular Sciences Research Hub will convene the collective expertise of more than 800 scientists, clinicians, engineers and business partners under one roof to address global challenges across areas such as energy, healthcare and sustainability. Imperial’s world-renowned Department of Chemistry has relocated to the Hub after more than a century in its historic home in South Kensington . This legacy is marked by the original 1846 foundation stone, placed by Prince Albert, which is now housed in MSRH. Speaking at the launch event, the Mayor praised the global talent at MSRH. He said: "As I was touring the laboratories I met Londoners originally from New Zealand, Singapore, Malaysia, Italy, Spain and Denmark, all proud Londoners. Come what may with Brexit, London will, as President Gast said, always be a global hub for innovation, technology and business. That’s why it’s so important we must pursue bold, innovative projects like the Molecular Sciences Research Hub. This new hub speaks to our ambitions as a city. It’s about our future and how we can harness human ingenuity, science and technology to solve many of the major challenges we face while improving the lives of Londoners and fellow global citizens." The Hub will push forward the molecular sciences as the disciplines increasingly tackle key societal challenges, including those of the UK’s Industrial Strategy Grand Challenges . State-of-the-art laboratories will be strengthened by new prototyping facilities and business incubator spaces to encourage entrepreneurial thinking and help to turn scientific discoveries into commercial products and services. Among the Hub’s technical and laboratory areas, which are clustered around a full height atrium and 250 person lecture theatre, is the Centre for Rapid Online Analysis of Reactions (ROAR) : the UK’s first national centre for the study of reactions, focusing on data-centric chemistry. 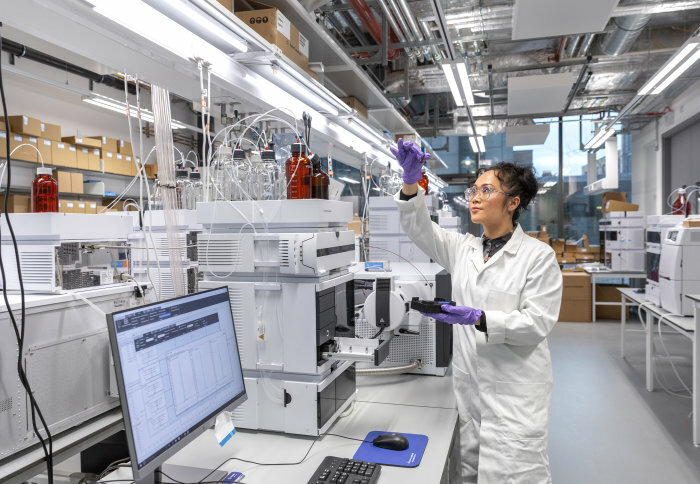 The Agilent Measurement Suite brings together private sector and academic researchers as they use and develop advanced analytical instruments to tackle scientific challenges including in health, the environment, energy and fundamental biology. Earlier this week, the Molecular Sciences Research Hub won a global S-Lab award for laboratory design, management and operation. The Molecular Sciences Research Hub has received financial support from Imperial College, the UK government’s Research Partnerships Innovation Fund , several private sector partners and philanthropists. The launch event formed part of ChemFest 2019 , a festival of chemistry being held by the Science Museum, V&A, Imperial College London, Royal College of Art, Royal Commission for the Exhibition of 1851, the Royal Albert Hall and Royal Society of Chemistry to celebrate 150 years of the periodic table of the elements.